11:53 pm – As the train rushes over the Burnhamthorpe Road level crossing, there is a loud bang. Lynne Riddel, of Freeport Crescent, sees a red-hot set of wheels from the train cartwheel 50 feet through the air and crash into her backyard. 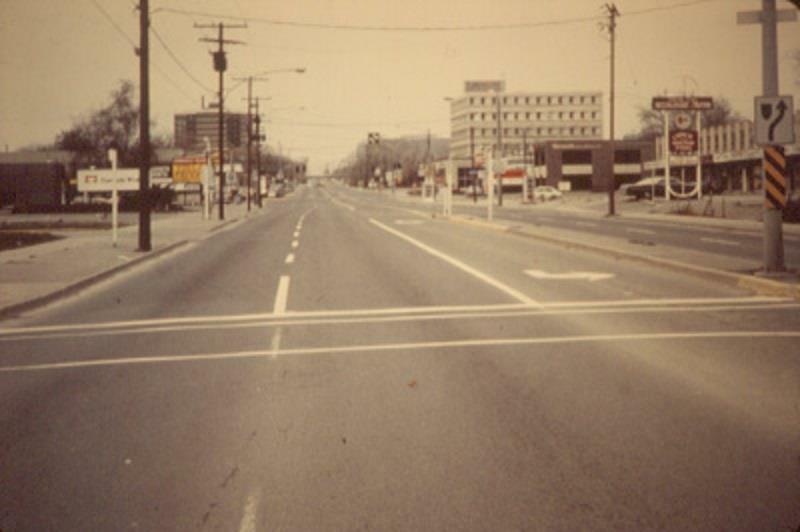 11:56 pm – Three kilometres down the track, Ron Dabor nears the Mavis Road crossing in his car. His wife, Kay, notices sparks flying from Train 54. They begin to count the cars. They reach 27 and, then, amid a screeching of tearing metal, tankers in the train begin to smash into each other and 25 topple from the rails. Dabor quickly stops, then reverses at full speed. As their car goes into a ditch, the couple leapt out to flee the orange fireball that erupted 1000 feet into the night sky. In the lead locomotive, the air pressure falls and the brakes on the train lock automatically. 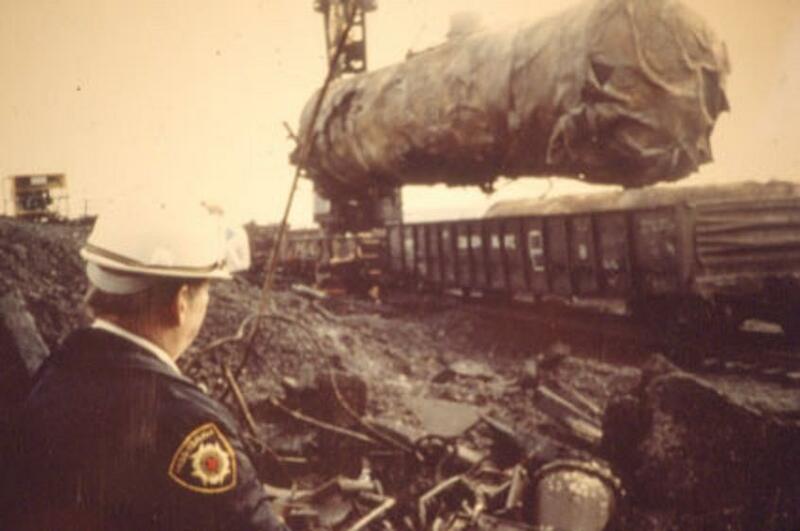 Brakeman, Larry Krupa, cries to his father-in-law, engineer Keith Pruss: “Oh, my God, we’ve got a tanker afire!” They see flames shooting 40 storeys high as tankers explode in a roar of gaseous fury. 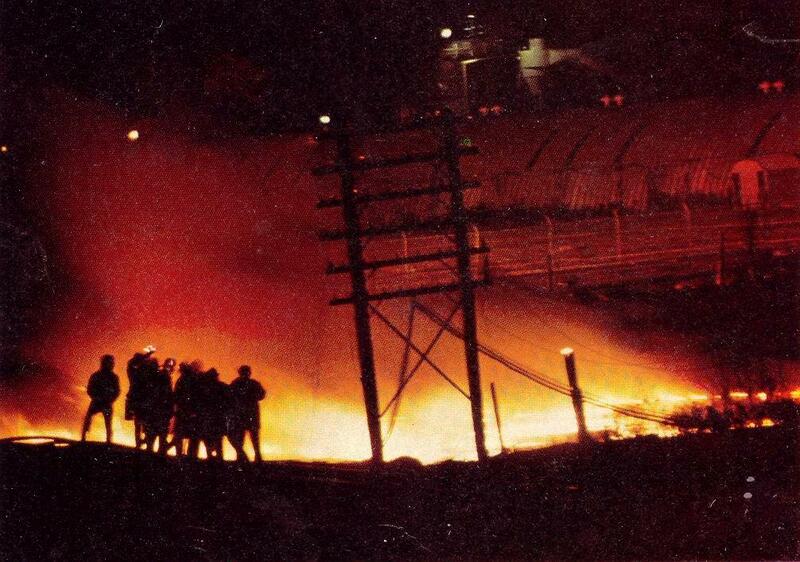 11:57 pm – Every available piece of firefighting equipment in Mississauga is ordered to the blaze. 27 cars, many with explosive and flammable contents, are still hitched to the train. 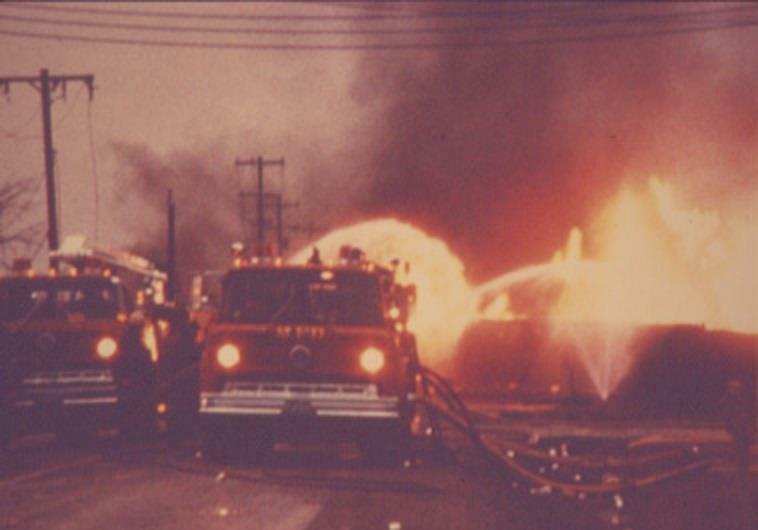 11:58 pm – Brakeman Larry Krupa runs toward the flames, uncouples two tankers, enabling his father-in-law to pull the 27 cars away from the searing heat. The remains of Train 54 stop seven kilometres down the line. Krupa is recommended for the Order of Canada for his bravery. 12:01 am – A second explosion. The flash is seen as far away as Niagara Falls, Oshawa and Peterborough. The noise awakens tens of thousands throughout Toronto. The blast was so powerful that one tanker is hurled a kilometre away. Firefighters do their best, but can make no impression on the raging flames. 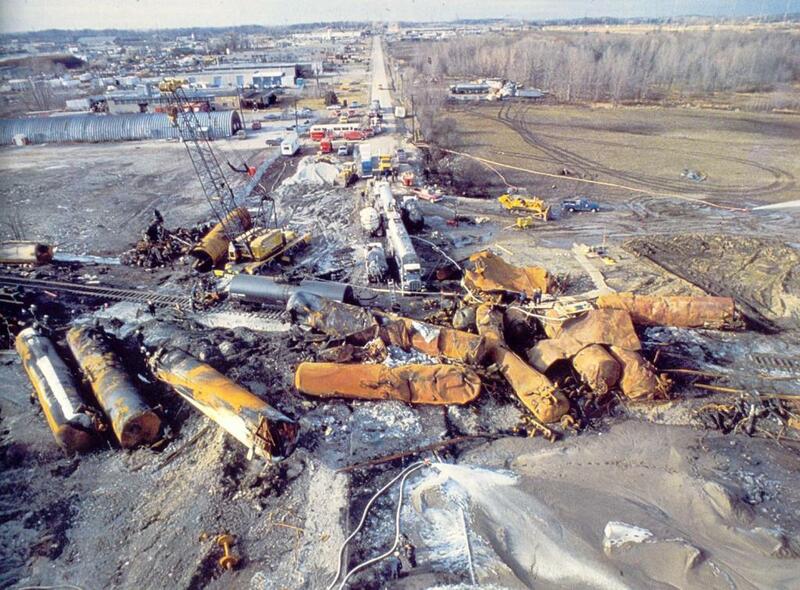 Eleven of the derailed tankers contain highly-explosive propane, and one tanker held the 90 tons of chlorine. 1:30 am – As the location of the chlorine tanker become known, a shudder of fear runs through the fire and civil defence chiefs. They know that the heat can change chlorine gas into even-deadlier phosgene – the gas that killed thousands of soldiers in the First World War. 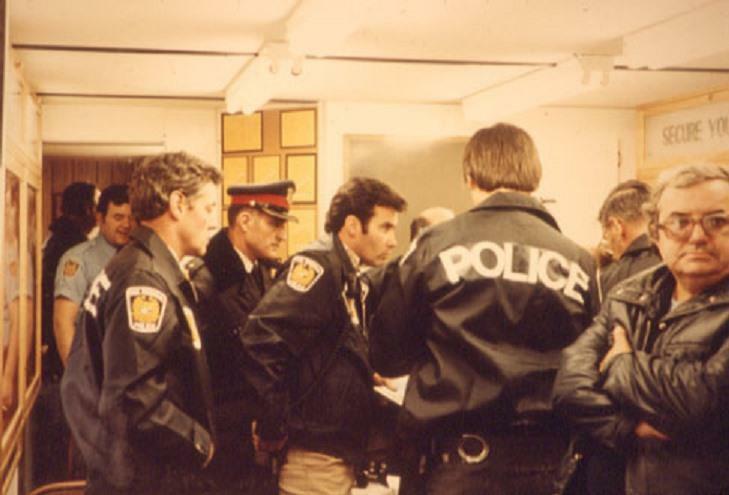 Peel Regional Police Chief Doug Burrows give the order: “Evacuate!” Immediately, police start to rouse and move out 6000 people living in the immediate area, the start of what is to become the largest evacuation ever in North America. 2:15 am – The provincial ambulance co-ordination centre calls in all off-duty personnel. 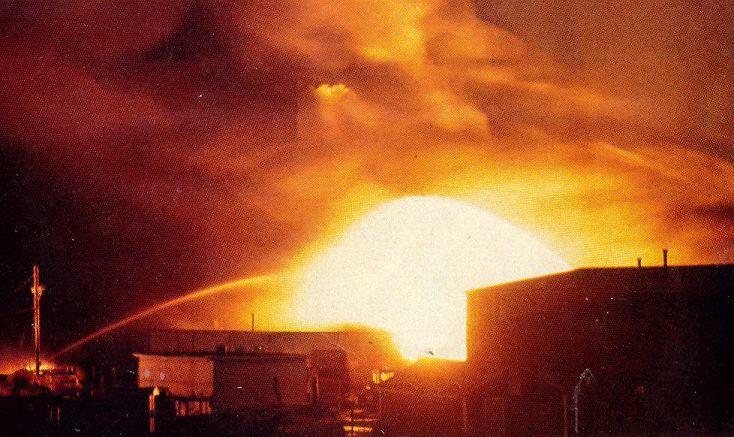 4:00 am – A third explosion as more propane tankers go up. A second wave of evacuations is ordered. 20,000 people leave their homes and 7000 more are sheltered at Square One. 6:00 am – The chlorine is leaking! A 3 foot hole is glimpsed by firefighters in the side of the tanker, just as they begin to gain some control over the blazing inferno. They allow for a controlled burn to dissipate the explosive gases while keeping their hoses on the chlorine tanker to prevent it from heating and exploding. 8:30 am – Attorney-general Roy McMurty, head of the provincial government’s emergency planning committee, arrives on the scene. 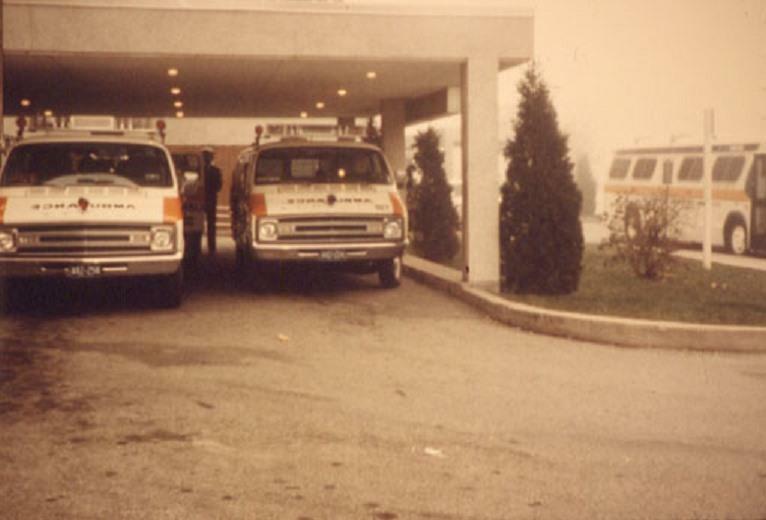 9:35 am – buses and ambulances line up to evacuate patients from the Mississauga Hospital. 9:50 am – The wind increases and evacuation boundaries are again expanded. 10:00 am – Two explosions as another tanker ignites. Firefighters continue to valiantly battle the inferno. 12:30 pm – Evacuees who went to Square One are moved farther away, to Sherway Gardens. 1:00 pm – Experts from Dow Chemical Company in Sarnia arrive. Computers are used to produce weather forecasts and the evacuation boundary is expanded again. 1:35 pm – The evacuation of all persons is ordered from an area bounded by the Credit River, Burnhamthorpe Road, Cawthra Road and the Lakeshore. 70,000 people have had to flee the 25 square mile area. 3:40 pm – The sixth evacuation order clears an area from Royal Windsor Drive to Dixie Road. By 6:00 pm, orders are given to evacuate Queensway General Hospital and all nearby nursing homes. 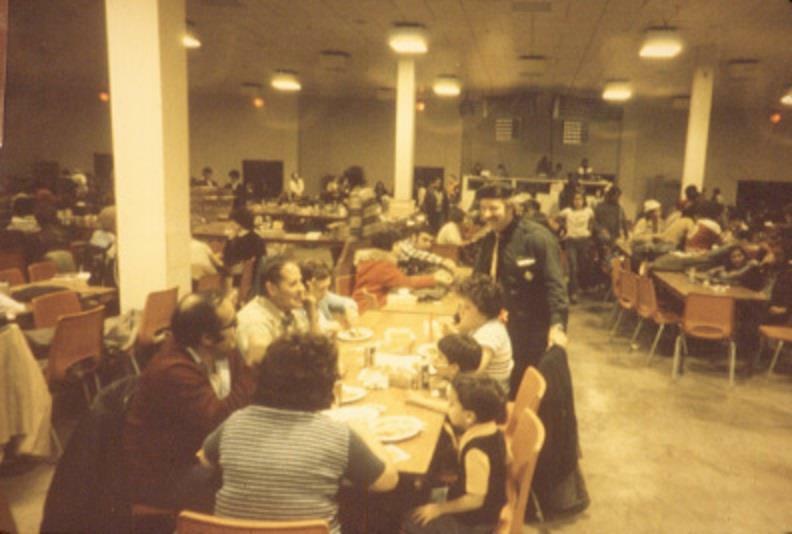 The evacuees who went to Sherway Gardens are told they must move yet again, to the International Trade Centre on Airport Road. 9:00 pm – The evacuation zone is expanded yet again, from Ninth Line to the Etobicoke Creek. By 11:00 pm, the evacuation order has spread to Oakville as far as Maple Grove Road and the Oakville-Trafalgar Hospital is evacuated. 12:00 am – By midnight, the evacuation total reached 250,000 people. 1:30 am – Hamilton and the western part of Toronto are placed on alert for possible evacuation. By 4:10 am, the evacuation of 3000 Oakville residents is completed. Dawn – The fires in the wreckage finally go out. Experts estimate that 75% of the chlorine has escaped into the atmosphere. 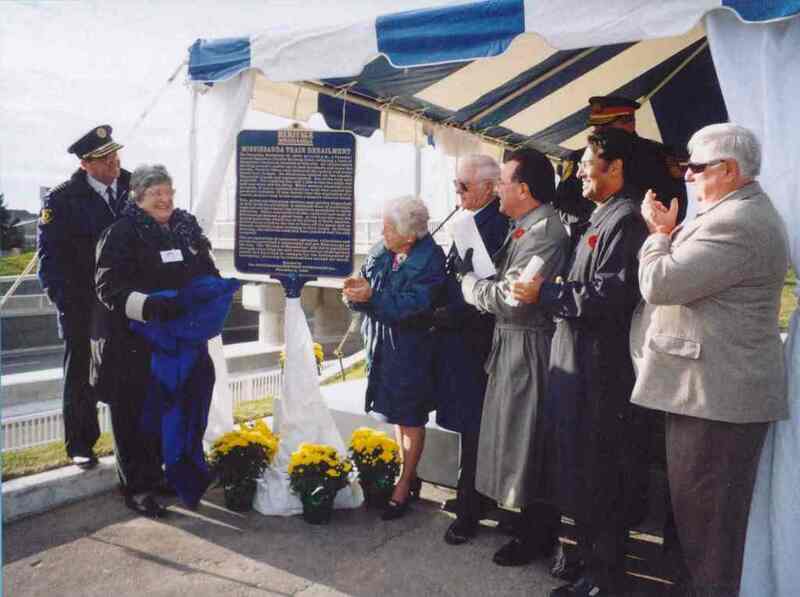 1:00 pm – 11,000 evacuees are allowed to return to their homes – and results in a massive, seven-hour traffic jam at the Trafalgar Road exit from the QEW. Work proceeds on draining the propane tankers. Each hour, 35 lbs of chlorine continued to leak from the damaged tanker as chemical workers spent a frustrating day trying to patch the hole. There is a scare when a large, white cloud escapes the tanker. During the night, pumping out of the chlorine begins. Pumping of the chlorine continues. Eight firefighters walk into a pocket of chlorine gas near the wrecked tanker and are admitted to hospital. Work crews succeed in draining almost all of the remaining liquid chlorine – 14 tons – from the crippled tanker. More than half of the remaining 33,000 evacuees return home. At 7:42 pm, the last evacuation order is lifted and the remaining evacuees are told they can go home, thus ending the largest evacuation in North American history without a single loss of life! 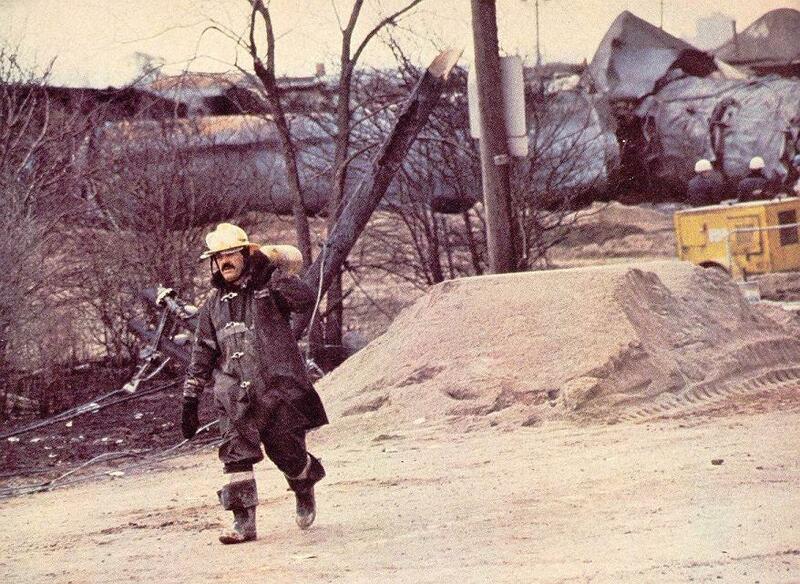 -Bob Barridge, first policeman on the scene of derailment. -Cal Miller, Mississauga resident and first newsman on the scene. -John McGlashen, Mississauga resident, lived three blocks from derailment. -Cal Millar, Toronto Sun Staff Writer, lived closed to the derailment site. 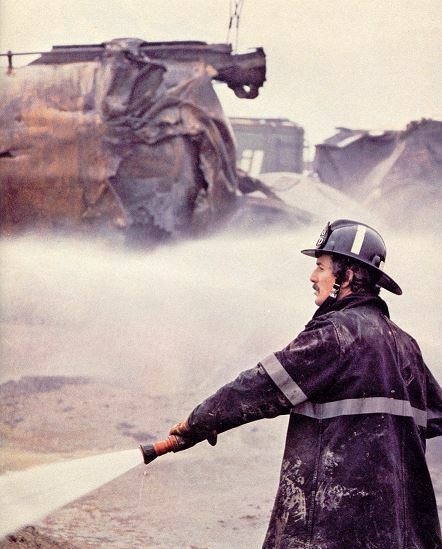 -Dave Ewing, one of the first three firemen on the scene. -Deputy Fire Chief Ross Kelly. -Deputy Fire Chief Art Warner.